Here you can look up the official specifications to a limited number of Russian tubes. I will add more tubes as I have time and if I feel the numbers have a direct bearing on how they are used, abused, and criticized today. Make sure you are sitting down, and click on the links below to download the datasheet which shows how these tubes ‘should‘ be used..
6n6p (6Н6П) – The 6N6-P is a small signal dual triode often used in pre-amp stages. So, what does all this mean? Look to the maximum voltage and current ratings. Now compare these numbers with a ‘plain’ 6L6GC or 6V6 etc. Can you see how blindly measuring plate current, thinking you have a ‘normal’ tube, can lead you down the wrong path? This is the plain and simple reason why so may ‘gurus’ do not like using Russian equivalents; they are not the genuine article – never have been, and these ‘gurus’ do not know how to properly evaluate these tubes. That would take test equipment, and spending time using it. Your average ‘guru’ has his Fluke DVM, and that’s it. The simple fact is, setup correctly, as the manufacturer intended these Russian equivalents can be very good, but don’t just plug them straight into your vintage amp and expect them to work as if they were the real thing. Pre-WW2 soviet tube coding consisted of 2 or 3 cyrillic letters followed by 3-digit code. Well before WW2 began, FDR was fueling Joe Stalin, pumping tubes and tube-building machinery by shiploads. In 1939 (according to post-WW2 sources), this new machinery already produced the American tube types under their original names, in such amounts that in the same 1939 the American convention, transcripted to Greek letters, became a codified standard, so far coexisting with indigenous naming convention. Military hardware received from the U.S. in 1941-45 was equipped mostly with VT-coded tubes. VT-tubes left very scarce traces in Soviet tube annals, just like British tubes. Of course, most of these VT-s were destroyed in action soon upon arrival and never needed maintenance. But I presume the main reason is that civilian American tube codes were a generally accepted standard well before WW2. Original octal tube codes like 6J5, 6N7 etc. that were reproduced as is in the Soviet Union received names directly transcribed from originals. For simplicity, only one ‘middle’ letter was left out. The trailing number lost it’s ‘pin count’ designation, becoming simply a serial number. Eventually, the code table was extended to accomodate nearly all new tube types, and as the pre-WW2 designs were retired, became a unified standard (1959). Some older tubes survived until the end of tube era with original non-standard names (i.e. G807). Gas regulators usually follow the 1959 standard, omitting heater voltage code. In the English-speaking audio world, Soviet single and dual triodes names are frequently written as 6H** or 6C** in Latin letters, which in my opinion is misleading although graphically identical (and accepted by the Chinese ). That’s why I (like the fellows at Svetlana and many others) use phonetic transcription: triode types are 6n** and 6s**, etc. To separate Soviet and American (and Chinese) tubes with the same Latin names, American originals are written with a #prefix (#6F6, #6SN7). The second element (Device Type) is sometimes inconsistent. For example, TV damper diodes can be found under both *Z** (Rectifiers) and *D** (Single Signal Diode) coding. They all can be used as AC power rectifiers within their I/V ratings. Similar confusion with 6F6S – it’s a pentode and not a Triode+Pentode as letter *F** suggests. But it’s a glass incarnation of #6F6. Some very rugged tube types do not carry ‘advanced’ suffixes, because they were originally designed to advanced specs. Some other rugged tubes exist only as -E or -EV grades (i.e., 6S45P-E and 6N30P-EV exist, but no one ever heard of plain 6S45P or 6N30P). Anyway, the curves and nominal PIV for regular and improved versions are identical, with very few exceptions. 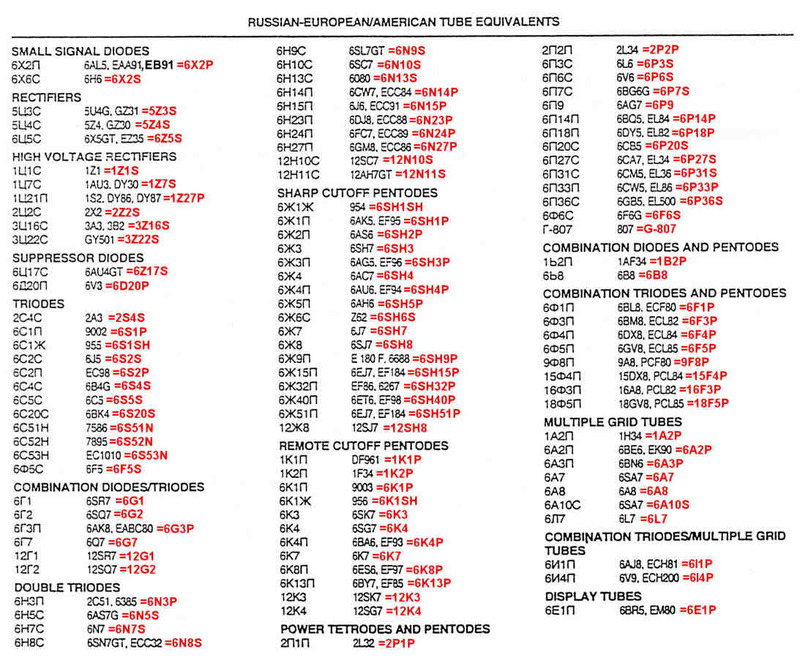 Here is a handy sheet which shows ‘equivalent’ Russian tubes to popular US and European ones. When using this chart, bare in mind, the lessons from above. Some of these tubes may need circuit modifications to perform properly (or even at all). Before using any of the ‘equivalents’ on this list, compare the basing, pinouts, maximum voltage and dissipation for the tube and be prepared to alter your circuit accordingly. It is a shame but in this strange world we live in, the following disclaimer is now a sad necessity. As with all things ‘tube’ related, much of this information is old and may no longer be valid (it may never have been valid). The information supplied is accurate to the ‘best of my knowledge’. By using this information, you agree that I am not responsible for any injury, damage or malfunctions, real or perceived, caused through inaccuracies, errors or omissions in this data or in these articles and commentaries. The reader assumes all responsibility for the use of any of this data and is solely responsible for any damages, injury and/or costs that may result. Use this information with care.